The USDA is predicting an almost 4% increase in pork production this year. We find this a reach with slaughter weights running below a year ago and the U.S. breeding herd showing no increase since June 1st. The USDA is projecting 6300 million pounds for export which would we believe is a record amount. Per Capita Disappearance at 51.3 lbs is up over 3% from the 50.1 lbs. of 2017. A positive step if we don’t get increased consumption from just being cheaper. USDA is projecting U.S. live hogs to average 41-44₵ lb. in 2019. If true lots of money will change hands for no profit. USDA reports 2017 averaged 50.48₵ lb. 2018 averaged 45.93₵ lb. 2019 projected – 220.8 lbs. More People eating more and more meat proteins, not exactly indicating a vegetarian ground swell. Appears there are next to no new official announcements on African Swine Fever (ASF) breaks in China. Probably a reporting issue rather than lack of new outbreaks. Keep in mind China Data indicated a decrease of 699,000 sows in the month of December. This past week was Chinese New Year- in the year if the pig. This past week the Economist magazine had a full page article on ASF in China. It’s part of the non-ag media catching up to the massive liquidation ongoing in China. The last few weeks we have attended several pork shows. At them we have heard that Chlamydia seems to be present in some gilts being purchased resulting in gilts that won’t come into heat and in some instances becoming blind. Seems to be getting confused with PCV3. 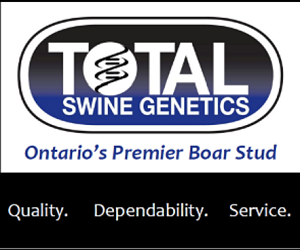 We would suggest have your gilt supplier confirm Chlamydia status of gilts before delivery. Pig production is tough economically. It’s best to minimise any sources of problems.